Mom: Aidan, why are you crying? Aidan: Evan didn't put his deodorant on and I don't want his stink on my blanket! Do you have imagies of Haley Mills in a camp shirt and tan shorts? If not, then you're probably not old enough to remember the old Disney version of The Parent Trap. Anway, it was the inspiration for a bit of creative discipline at my house today. Evan and Keven have been at each others' throats. Nearly literally. They've been snipping, snapping and crabbing at each other all day long displaying the most stinkin' attitudes I've seen in a long time. So, I cured their stinkin' attitudes. My magic potion? Let the punishment fit the crime. I thought one might end up dead if I did what the camp director did in the Parent Trap. I wasn't about to sacrifice a child just to teach them how to get along! So, I instituded a little creative discipline. Stinkin' attitudes get stinkin' work. One scrubbed the bathroom, toilet, potty chair and floor (and with all the boys in the house I don't have to tell you what a stinkin' job that was!) The other boy took out the trash, scrubbed down the walls and floor around the garbage can and scrubbed down the garbage lid. So, while I had another great post thought up for Works for me Wednesday (tons of other bloggers do, so click over to Rocks in my Dryer), I'm going to have to put that one aside and focus on this one instead! :) "Stinkin' attitudes get stinkin' work" works for me! don't forget the ginger ale! Over the past week and a half of having our nephew, Keven, my children have learned the fine art of the tattle. They give you just enough information to make you think about detaching your heiney from the chair, but not enough to actually get in trouble for tattling. Or doing ANYTHING wrong. Keven just came in the house. "Aunt Tara, Toby's nak@d." I'm sure I'm supposed to be concerned that my three year old is outside running through the sprinkler in the buff, but really, I'm tired. I asked him if Toby was hurting anyone. Keven may thing we are the weirdest family on the block simply because I'm too tired to care that Toby is letting every square inch of his little self enjoy the sprinkler! I think I may take some Popsicles outside. But first I have to detach my heiney from the chair! I think I've mentioned a time or two that my nephew Keven is visiting us for two weeks (one down, one to go) thus taking our kid count from four to five. Sometimes it feels more like fifteen, but that's beside the point. I have never been so tired in all my life! And that includes being up at night with baby nurslings for years on end! At the end of the day when Jim asks me what I'm planning on doing I tell him, "as much nothing as I can manage to squeeze in." It doesn't help that this week is Vacation Bible School at church and I'm in charge of "tour leading" a group of kids ranging in age from 4 to 5th grade. Lovely. Fun, but lovely. So, how do I manage to keep a house tidy-ish (I subscribe to "Good Enough Housekeeping"), keep five kidlets occupied and fed and clothed and entertained? It's really easy. Great Expectations. I read it to them until they're either comatose or begging to wash dishes or some other drudgery chore. No, I'm kidding. I have great expectations for the kids! My kids do chores. They work, they entertain each other and their TV watching is really limited. I have found that children will do what you expect them to! But, they will rarely do more than you expect from them and will only do less than you expect if you allow them to. I have tons of examples bouncing around my head of this, but I will only entertain you with one story. Every day I sit the children down to do schoolwork. American children spend the first two months of every school year re-learning what they learned the year before (academically and socially). They also lose a month to teacher workshop days, Christmas/Winter/Spring break. That leaves just six months of actual new learning! No wonder American children are so far behind the rest of the world, but I digress. I would rather have my kids have a head start on the school year by never stopping the learning. So, every day Evan and Keven are doing two third grade reading/English/Spelling papers (two sides each) and one math fact/skill paper. Having been with me now for over seven years, Evan knows that when I tell him that he's to read the paragraph and answer the questions he is to read the paragraph and answer the questions. Keven, however, takes those directions to mean read the questions and guess. Since Evan does what is expected of him it usually takes him approximately twenty to thirty minutes to do all of his school work. Keven believes somewhere inside himself that if he acts really cute then I will let him lower my expectations. I think not! So, today we spent two hours reading the paragraphs, looking for answers to the questions and underlining them so I know he found the answers and didn't just make a good guess. Lest you think I'm being cruel, he is getting some breaks in there to run around the house, sharpen his pencil, and generally squirrel around! :) But, I'm not letting him lower my bar! I think the fact that we have a lot of kids helps my score! And if four weren't enough, for at least this week and possibly for two weeks we're up to five! My niece has had some trouble, so her brother is staying with us so her Mom can have a break! K has been a little bit of a challenge in ways I won't go into here. We'll just say that everyone is on a learning curve. K is learning how things work around the farm. Evan is learning how to get along with people he may not necessarily appreciate and I'm learning how to juggle more creative discipline, cooking and laundry than I ever thought possible! Read Jim's take on the experience here. This afternoon we had some friends over. Leah and two of her kids came to play. Leah and I eventually made our way outside to take a look at the kittens. Scruff, the mama cat, was enjoying a nice afternoon snack...of dead mouse. Well, I guess it's better than a live one! The kids (a total of 5) were all watching the kittens romp in the weeds and while they noticed that Scruff was dining on Mickey's cousin, they weren't bothered at all by it. They seemed to take it in stride that cats kill and eat mice. Circle of life and all that rot. In fact, Toby went to take the mouse away from Scruff to get a better look at it. I stopped him just before he grabbed the mouse with a cookie bar in one hand. Toby, not the mouse. The mouse wasn't really up for a cookie bar. Scruff got him before he could get to them. "Toby, don't touch the dead mouse." "But Mom, I wasn't gonna' eat it for heaven's sake! I just wanted to look at it!" Good thing. Scruff might have given you a run for your money, Toby! Yack. Last summer I posted about our rotating chore chart. That worked great...last summer. This summer I wanted to kick it up a notch. This year the boys are bigger and the jobs they can do are bigger and the money they want to earn is bigger!!! Animal feeder: Feed and water the cats and chickens. Bed maker: Very neatly make the beds that belong to children. This is a morning job. Bus boy: Clear the table after lunch and dinner. Dishwasher empty-er: When Mom says to empty the dishwasher you empty the dishwasher and put the dishes away. You can nicely ask a brother to help you. Garbage/recycling man: Anytime during the day. Empty the bathroom garbage into the kitchen garbage and put the can back. Take out recycling from the kitchen and sort it in Mom’s garage. Laundry man: A morning job. Bring the laundry down from upstairs and sort it in the laundry room. Also do any other laundry related job Mom asks you to do. Mailman: An afternoon job. Go to the mailbox and bring in the mail. You’ll also take any mail out to the mailbox. Odd jobs man: Mom calls on you when she has a job to do that isn’t covered by the other chores. Table setter: Set the table for lunch and dinner. Water boy: Waters the gardens including the big veggie one, the kitchen garden, the yard tire and the patio line of flowers. Anytime during the day is fine. You can nicely ask a brother to help. Water heater guy: Evan or Aidan only. The water heater guy turns the water heater down after Mom and Dad have showered. Note that some are morning jobs, some are afternoon jobs and some are jobs where the standards would have to change depending on which boy did the job! For example, Evan unloads the entire dishwasher, but Toby only has to unload the silverware. 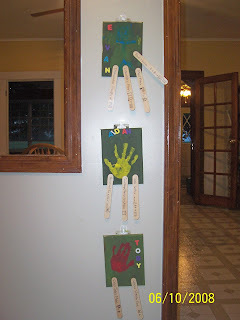 I wrote each job on a big Popsicle stick and put a Velcro dot on the back. Each boy has a certain number of Velcro dots on his chart. Every morning the boys choose their jobs from the job stick cup (fancy schmancy title, huh?) and stick them on their charts! After completing a job the stick goes back in the cup. Now, comes the big question, do you pay your kids for chores? Well, yes and no. Toby doesn't really understand money since he's only three, so, no. 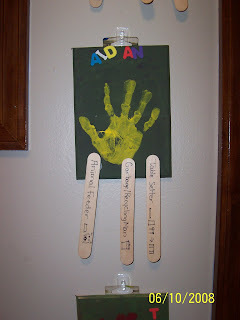 Aidan gets a whole dollar at the end of the week simply because he's helping save up money to go in on a Star Wars or Indiana Jones Lego set with Evan. Evan gets paid on a "base plus commission" basis. He gets $3 each week for jobs done well and with a good attitude. Any jobs left at the end of the day that I have to do cost him $.25. If he does jobs above and beyond his regularly scheduled chore chart jobs he can negotiate for "commission" or we can "catch him being good" and reward him accordingly. I have a little "time card" on the fridge where he records his extra earnings. So, while our earlier version of the chore chart worked for me, this newer one Works For Me now! Shannon has links to tons of other great ideas at Rocks In My Dryer. And while you're at it, read through some of her other posts because she's got a great all around blog! Last night I served the kids jello. Because we're classy like that and I was hoping a square of sugar counted as a side dish. Anywho, Evan told Avery to eat her jello. She immediately pointed to the phone, put her hand to her ear and started babbling away! Apparently she mistook the J in jello for the H in hello and was ready to talk on the phone! 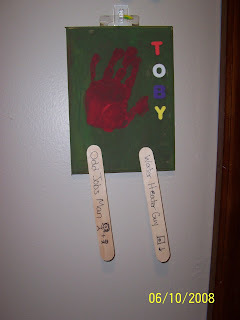 And then this morning I was commenting to Avery, "look at you walking all over the place" when Toby piped in, "Yeah! Now she's just like us!" Shannon's doing it again! www.wowonline.com has given her 20 boxed CD sets to give away! So, all I have to do is link to www.wowonline.com and I will be entered in a chance to win enough music to last me until Avery's in college! ;) So, here's me, linking to www.wowonline.com and hoping to be not only entered in the www.wowonline.com giveaway, but hoping to win the www.wowonline.com CD collection! Link link link. Think that covers it. 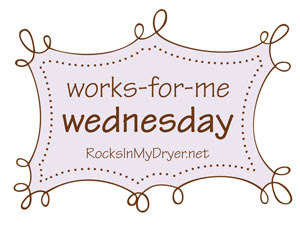 As usual, the lovely, talented, creative, generous Shannon at Rocks in My Dryer is hosting this edition of Works for Me Wednesday! Today we have a theme, "Mom, I'm bored". So, without further delay, here we go! First off, my kids know better than to use "Mom, I'm bored". If I hear those words I find something for them to do: work. So, instead they mope around the house, flopping on furniture, whining, futzing with each other and basically making a nuisance of themselves. So, this summer I've instituted several ideas for (hopefully!) beating summer boredom! You'll notice several things on the schedule. One, there is no TV from 9-4 during the day. I've been rather disgusted by myself in my allowing the kids to watch TV so much of the day so I'm formally limiting it. The second big thing is that they are picking chores to do each day. This is done by a "lottery" sort of system. Tune in same time same station next week for more details on my chore system for the summer! Ask how you can be helpful! The list is printed out and posted on the fridge. 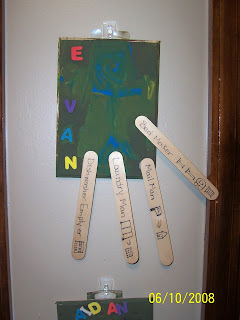 Evan can read, so he can help the lil'uns find something to do! He's great at getting the gang of brothers together to play. Keep in mind that we're 11 days in to summer break. So far I've yet to hear anyone utter "Mom, I'm bored" so I guess this is one tip that works for me! Ask me in September how it went. So far so good! In other news, Evan has turned a new leaf. He's being really helpful with a great attitude. He has been upstairs with the brothers for over an hour playing nicely with them. Avery is finally done being sick. She spent the last week crying and whining and screaming. The aliens who abducted her 10 days ago finally returned her on Saturday. She woke up after a morning nap as her regular grinning, giggling self! She had a well child check this morning which turned out to be a sick child diagnosis. Why is it that my children never have the failsafe symptoms of an ear infection??? At any rate she's weighing in at a whopping 19 lbs 7 oz! This at 15 months. So, she's in the same shrimpy growth curve as her older brothers. Go figure! Tune in again tomorrow for Works For Me Wednesday, "Mom, I'm Bored" edition! It's sure to please!